We've learned a ton from blog posts, tweets, and newsletters from others in the community. We try to always give back. Our blog is called Giant Robots Smashing Into Other Giant Robots. When someone wants to write a post, they write its headline as a Trello card in the "Next Up" list of the board, and assign the card to their Trello user. Spend time writing and re-writing a great headline. It helps narrow focus, figure out the purpose of the post, and grab people's attention in the first place. When we begin writing, we move the Trello card to the "Drafts" list. We write posts in Markdown, and store them in our blog's GitHub repo. We add tags to the post, which help our readers find related blog posts. When we're ready for feedback from the team, we move the card to an "In Review" list and share the Trello card's URL with the team in Slack. We make changes based on their feedback and our judgement. When the post is ready to publish, we give it a publication date, merge, and deploy. Our RSS feed, Zapier, Buffer accounts are set up to automatically work together to link to the post from Twitter, Facebook, Google+, and LinkedIn. We also link to the post from Hacker News, Reddit, Delicious, Pinboard, or other appropriate sites. 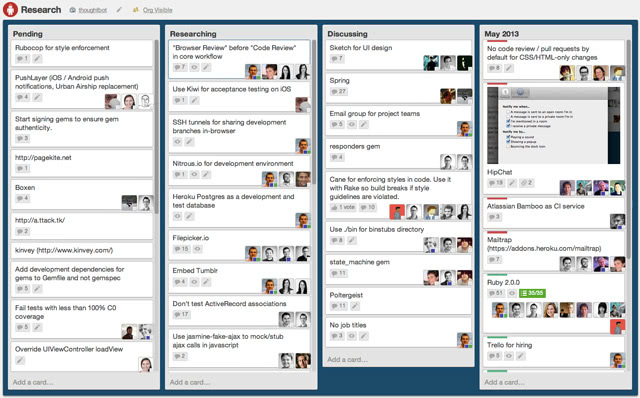 Finally, we move the Trello card to the "Live" column. Everyone on the team has access to our thoughtbot Twitter account and can tweet at any time. If the tweet is not time-sensitive, we use Buffer to queue up tweets and keep a schedule. We try to be conversational, casual, and real on our Twitter account. We talk the same way as we would in person among ourselves and be good-humored. Puns are encouraged. We aim to keep the quality high and for every tweet to be a hit. We want to avoid spelling mistakes, and use proper punctuation. We should respect the people who follow us. To reach the largest audience, don't begin a tweet with a Twitter username. Some tweet ideas include announcing meetups, open source releases, enthusiasm about a new tool or technique, tips on Git, Unix, and Vim, links to our blog posts, links to others' blog posts if they are excellent and not on the current Hacker News or Twitter cycle at the moment, and Funkmaster Flex. We have a verified Twitter account and are a Twitter Ads customer. With this we can see analytics such as number of retweets, favorites, replies, clicks, follows, unfollows, and how tweets compare in terms of engagement. Promoted Tweets campaigns are best for short term campaigns to drive traffic to a website. Target 10-25 similar, relevant @usernames in each campaign. Create different campaigns for different themes of people so that we can track performance per theme. We rigorously conduct experiments on new tools and techniques. Once an experiment has concluded we try to share the results in the appropriate channels. That may be this Playbook, our blog, twitter, or elsewhere. We've created a number of open source libraries to help us perform common tasks and give back to the community. 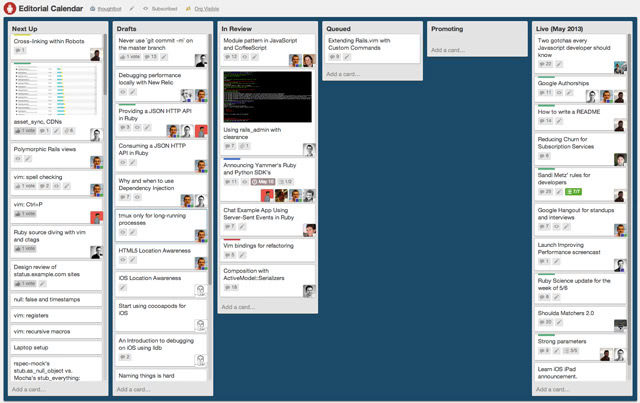 We track the current open source leaders on our Investment Time Trello Board. You may want to check with the project leader to see what would be most useful, or whether or not they're on board with your idea. Send pull requests rather than committing straight to master. Try helping out with existing pull requests or bug reports. Documentation patches are a great way to get familiar with a project. Extractions are likely to be more useful than Brave New World ideas, because you're extracting something that has already proven useful once. If you create a new library, you're expected to lead it, at least for the beginning of its life. Make sure you have time to maintain it. Try not to duplicate something that's already been done well. Look around to make sure your problem hasn't already been solved. Fixing bugs that affect client projects or introducing small features that would really help a client project is fine during client time. Most open source work should be conducted during investment time. Think about whether your idea makes more sense as a pull request to an existing project.